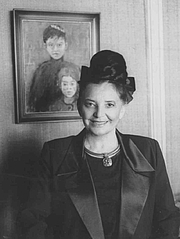 Yaffa Eliach, née Sonenson, was born to a Jewish family in the shtetl of Eishyshok near Vilnius (present-day Eišiškės, Lithuania). During the Nazi Occupation of World War II, when she was a small child, most of the Jewish population of the village was murdered. She and her family hid in various places in the area. Her mother and a brother were killed in 1944 during fighting between the Red Army/NKVD and the Polish Home Army. She survived and went to the British Mandate of Palestine in 1946, emigrating to the USA in 1954 and settling in New York. She married David Eliach, a high school teacher and principal, with whom she had two children. She earned her BA and MA degrees from Brooklyn College, and a Ph.D. in 1973 from the City University of New York in Russian intellectual history. She became a professor of history and literature in the Department of Judaic Studies at Brooklyn College, and founded and served as director of the Center for Holocaust Studies in Brooklyn. Prof. Eliach has devoted her career to the preservation of memory of the Holocaust, specifically from the perspective of a survivor. She has written several books, including Once There Was a World: A 900-Year Chronicle of the Shtetl of Eishyshok (1998); Hasidic Tales of the Holocaust (1988); and the memoir We Were Children Just Like You (1990). She has contributed to Encyclopaedia Judaica, The Women's Studies Encyclopedia, and The Encyclopedia of Hasidism. She also created the "Tower of Life," the permanent exhibit of approximately 1,500 photos of Jews in Eishyshok before the arrival of the Germans for the U.S. Holocaust Museum in Washington, D.C.
Yaffa Eliach is currently considered a "single author." If one or more works are by a distinct, homonymous authors, go ahead and split the author. Yaffa Eliach is composed of 3 names. You can examine and separate out names.